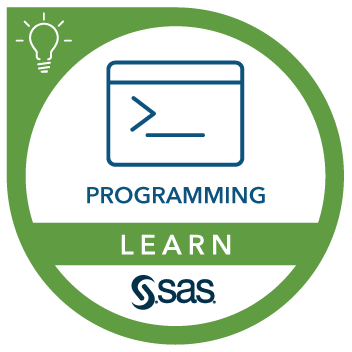 This course is for users who want to learn how to write SAS programs to access, explore, prepare, and analyze data. It is the entry point to learning SAS programming for data science, machine learning, and artificial intelligence. It is a prerequisite to many other SAS courses. If you do not plan to write SAS programs and you prefer a point-and-click interface, you should attend the SAS® Enterprise Guide® 1: Querying and Reporting course. use SQL in SAS to query and join tables. access data files on your operating systems. No prior SAS experience is needed. This course also addresses SAS/ACCESS Interface to PC Files. Includes this course, Programming 2, practice exam, exam voucher, and SAS Certification Prep Guide (pdf).